We offer 3 levels of leadership development programs to suit all your needs. From completely customized to off-the-shelf, we build the unique learning experiences that target your immediate and relevant business imperatives. 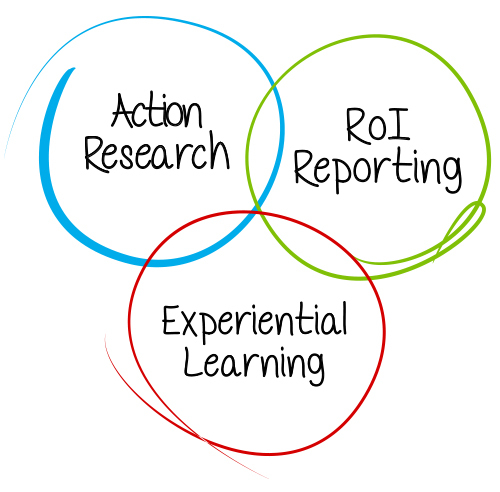 This is the soup to nuts, full service suite, that digs in deep by using action research, experiential learning, and ROI assessment reporting. It's a real science that results in innovation, problem solving, sustainable change, and measurable results for your enterprise. Some companies are transformed, some are even transmogrified, and afterward most consider us their life-long trusted advisors. Want learning experiences that target your specific culture and solve your real business problems? Then our tailored programming is for you. In one, two. three steps, we quickly assess your culture, brand, values, goals, aspirations and challenges, then align them to the learning you and your teams need most at the moment. Need something fast? We have more than 25 ready-to-go learning experiences that address the fundamentals for all leadership and management needs. They are uniquely designed learning experiences that train up your folks on the basics. Visit our store (click here) and feast your eyes on all our easy learning.